Note: See Irene’s updated chart of Russian crochet symbols with English translation at her website. At the end of the black and white pages of every Duplet Crochet Magazine is a crochet symbol guide with illustrated how-to’s of the various crochet stitches. The symbols and illustrations are also accompanied by explanations in the Russian language. In order to fully use the Duplet magazines, it is best to have some knowledge of the Russian language. There are several Russian language resources with particular focus on crochet, knitting and the other needle arts, for example this Dictionary. A good grasp of crochet symbols is likewise crucial, particularly if one is not fluent in Russian language. Thanks to Irene of Duplet-Crochet.com, we now have available as reference the crochet symbols used in the Russian language crochet magazines. Although these crochet symbols are “international symbols”, there are some variations in the symbols, pretty much “like the difference between the handwriting of different people” as Irene explained. Those who are new to crochet symbols and perhaps even those who are used to reading only a specific locale of crochet symbols, for example those employed in Japanese crochet books and magazines, usually find the shift from one handwriting to another (so to speak) as difficult and confusing. I think the key to understanding crochet symbols across a wide range of applications, is practice: to keep on reading and using crochet symbols in their usage in various publications in Russian, Japanese, Chinese or English or other. Crochet symbol pattern charts, I believe, may also be interpreted in more than one way. This is especially true of symbol charts that look as if they are “incomplete,” but are actually rather like the raw ingredients of a recipe book. In such cases, there may be a basic set of techniques needed to bring the ingredients together into a successful finished object. Such techniques may include methods of joining, methods of shaping whether increase or decrease, and methods of achieving correct sizes on multiples of stitches. Here is the symbol chart for a simple motif found in Duplet Special Swimsuit Issue 3. Refer to the Duplet crochet symbol chart in reading this pattern. Since this motif is crocheted in the round, we start reading the pattern from the centre of the motif although this is not particularly indicated in the pattern. Duplet patterns have rows and rounds that are generally unnumbered, and the start and ends of rows and rounds are likewise often unmarked. This can be confusing for many crocheters including those accustomed to Japanese symbol patterns where start and finish and all rows and rounds are marked and numbered. Thus, it is really up to the crocheter to interpret the Duplet patterns in accordance with experience and some basic symbol crochet reading directions such as: start in the centre for crochet in the round; and start at the bottom right going left and right in the upward direction for crochet in rows. Using thread colour A, ch 6, sl st in 6th ch fr hook. Rnd 1: In ring make: [sc, ch 5, dtr2tog, ch 5] 3 times, sc in ring. Fasten off. Rnd 2: Join thread colour B to sc with sc, [ch 5, sc in top of ch 5 of previous rnd, picot, sc in top of next ch 5, ch 5, sc in next sc] 3 times. Fasten off. It is possible that the last stitch of Rnd 2 is a sl st to join to the first sc, although such a sl st is not indicated in the pattern. Nonetheless, the sl st makes for a much neater join. Another possibility is that of a needle join instead of a sl st join. This means that you finish off with the last stitch of the round but not the joining st (such as a sl st) and instead leave a long tail for sewing into the first st of the round to join. You may also notice that Rnd 1 of the pattern is shaded in light gray. This helps to distinguish one round from another. Again, this is a motif crocheted in the round so we begin at the centre which is highlighted in light gray. Rnd 1: (In dark gray) Ch 6 (count as 1 dc and ch 3), *dc in ring, ch 3, rep fr * 4 times. Sl st in top of ch-3 to join. Rnd 2: (In light gray) Ch 1, *in next ch-3 sp make [sc, 3 hdc, sc], sc in dc, rep fr * 5 times ending last rep with sl st in first ch to join. Rnd 3: (In dark gray) Ch 6, *sk [sc, 3 hdc, sc], sc in next sc, ch 5, rep fr * 5 times ending last rep with sl st in first ch to join. Rnd 4: (In light gray) Ch 1, *in next ch-5 sp make [sc, hdc, 4 dc, hdc, sc], rep fr * 4 times, in last ch-5 sp make [sc, hdc, 4 dc, hdc] sl st in first ch to join. Rnd 5: (In dark gray) Ch 7, *sk [sc, hdc, 4 dc, hdc], sc in sp bet next 2 sc, ch 6, rep fr * 4 times, ending last rep with sl st in first ch to join. Rnd 6: (In light gray) Ch 1, *in next ch-6 sp make [sc, hdc, 2 dc, 2 tr, 2 dc, hdc, sc], rep fr * 4 times, in last ch-6 sp make [sc, hdc, 2 dc, 2 tr, 2 dc, hdc], sl st in first ch to join. Ch 17, sc in first sc and hdc, ch 8, turn, sc in ch-17 lp, ch 3, sc in same lp, ch 8, sc in hdc, turn, in ch-8 lp make [sc, hdc, 8 dc], ch 3, sc in ch-3 lp, ch 3, in next ch-8 lp make [8 dc, hdc, sc], sc in each of next 2 dc, sc in each of next 2 tr, sc in each of next 2 dc, sc in hdc, sc in sc, *ch 16, sc in next sc, sc in next hdc, ch 8, sc in ch-16 lp, ch 3, sc in same lp, ch 7, sc in sc next to base of start of ch-16 lp, in ch-7 lp make [sc, hdc, 8 dc], ch 3, sc in ch-3 lp, ch 3, in next ch-8 lp make [8 dc, hdc, sc], sc in each of next 8 sts, rep fr * 4 times ending last rep with sc in last 6 sts and sl st in sc to join. Now here is an even more complex pattern found in Duplet 112, with no numbering nor shaded areas to delineate the different rounds.The chain loops are also not explicitly illustrated in the pattern but are rather indicated in terms of a line and a number under the line. The number tells you how many chains to make. This pattern is completely workable and correct. Can you figure it out? 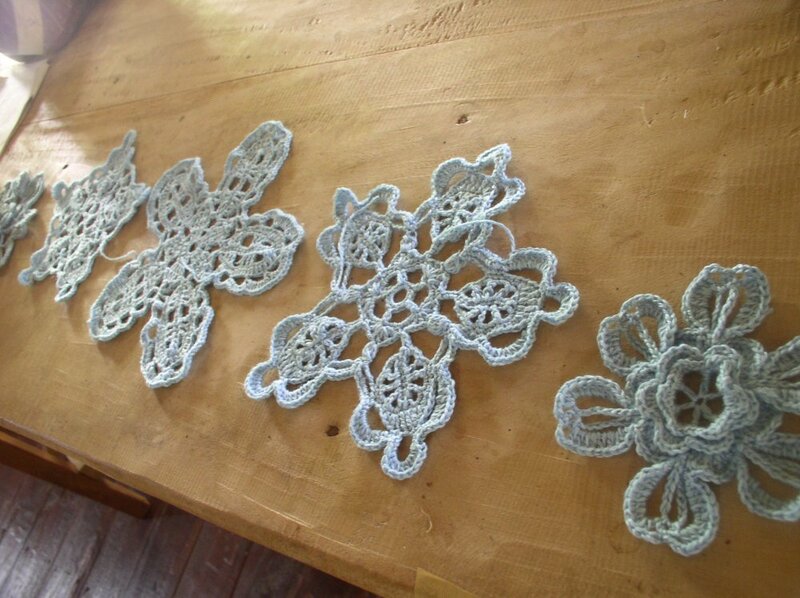 I have made the motifs shown above to make several crocheted garments, for example, a bolero crocheted in silk-cashmere yarn. You may find the finished bolero at Silky Cashmere Bolero. I think that key to understanding and creating from patterns found in Duplet and MOD Zhurnal and the many other symbol crochet patterns found in books, magazines and websites all around the world is a freedom-loving approach to crochet. Rather than a rigid adherence to every minute detail or the demand for precision in every single stitch pattern, a pattern design is seen as a possibility and an opportunity to construct something as beautiful as – or even more beautiful than – the finished objects presented with the patterns.